1. Reclaim the past. Oprah’s bold start, not with a “thank you” or an “it’s an honor to be here,” but with a jump back to a critical moment in her life experience. And she takes us along. “In 1964, I was a little girl sitting on a linoleum floor…” Immediately we see her as a little girl, staring up at the screen. We see Sidney Poitier’s white tie and black skin. She takes us right into a moment that is alive in her past and drops us into a moment of suspense. We say, “Where is this going?” Suspense releases dopamine, sparks curiosity, and enhances learning. Using the full capacity of the ancient mechanism called story, she takes us there and brings a long-since passed moment new life. 2. Exact change only. A story is a vehicle of change, a journey which takes us from how the world was to how it can be. Oprah models this with expert skill, by pivoting around several critical moments of change. Poitier wins the Academy Award. Her mom walks in, exhausted from cleaning houses, revealing a set up from ‘then’ to ‘now.’ There is a takeaway very early on, bringing a resolution to the first story – amen, amen – though she keeps building on it. She zooms forward to the beginning of her career, then to gratitude for her mom, for workers, for the “women whose names we’ll never know.” A big change, which envelops the audience. But more turns to come: Recy Taylor, whose tragic story becomes one of inspiration, and who not only got away with her but lived to be 98. Change, change change, little changes like perpetual gifts to the listener. 3. Take them deeper. The more specific the stories, the more universal the impact. Now Oprah is riding a massive wave of emotion, a rolling story of stories. And we’re swooping down the bottom of that storytelling wave. But she’s not yet done, she still takes us a journey of the past… It was somewhere in Rosa Parks’ heart almost 11 years later, when she made the decision to stay seated on that bus in Montgomery… Note the poetic license: Oprah wasn’t there to know this, but of course, how could Rosa forget Recy Taylor? This is not some general allusion to a civil rights heroine. This is an uncovered link, an illumination of links. Pain upon pain, fatigue upon fatigue, and one woman stood up. Now, we have jumped seamlessly from a little girl to an Academy Award, to a career began, to the women on whose shoulders Oprah has herself stood. We’re in deep. 4. Elevate out. Where to now? The real challenge in storytelling is not just to bring the audience in, but to also bring them up, and out. The power is not with those who have come before…It’s here with every woman who chooses to say, “Me too.” This has been the subtext of so very many articles and conversations and posts. An old story, a powerful story, but with a brand new twist. She weaves historical context, and that builds the speed to enact this memorable turn: For too long, women have not been heard or believed if they dare speak the truth to the power of those men. And then a long pause. The of the storyteller, using silence as a springboard: But their time is up. Their time is UP! Then, importantly, in the true spirit of collaboration, she widens the circle, in one mere line: And every man – every man who chooses to listen. Dang! 5. Land your meaning. Yes, it’s a speech about her life. Yes, it’s a speech about everyone in the room. Yes, it’s a speech about everyone who has posted, read, or even considered quietly their own #metoo. But most of all, Oprah makes clear, it’s about the little girls, right now, watching this speech. It’s about a new era, where the trial and mess has composted into powerful new sprouts. It’s about my daughter, your daughter, and a world where we don’t have to say the words that have been so often said in the past weeks and months. Oprah ends where she began. It’s that same world, only very different. In this world, we are out of the deepest darkness, and into the new view. The twist has been enacted. 6. Live the practice. Storytelling is a practice, not a perfect. It emerges from daily acts, and daily explorations of discovery, and of meaning. 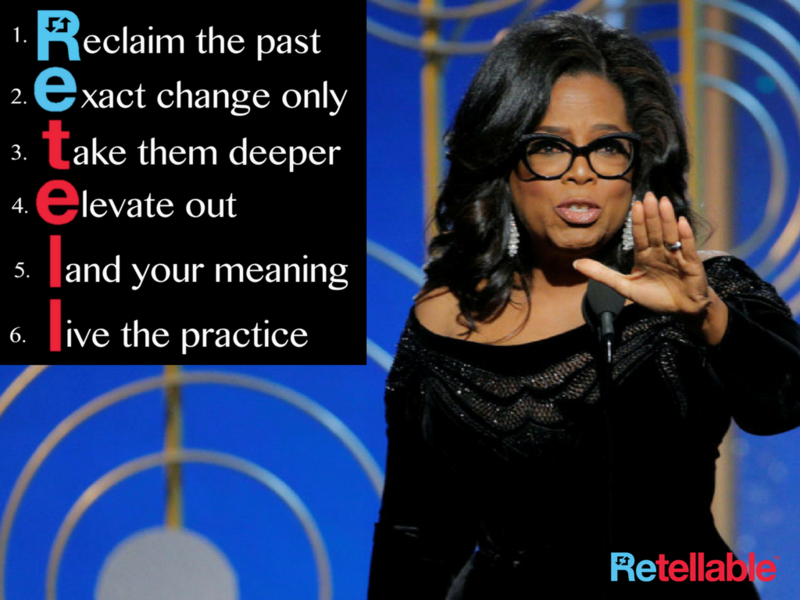 The practice builds comes from finding and telling stories, trying and toiling in them, asking and inquiring about them, and Oprah has made a life of this. That is clear. But storyteller is not just a role for stars and queens and CEOs. It’s a practice that can be developed by any person seeking meaning and insight, whether to deliver in front of an audience of one or one thousand. It begins, not with a world-changing story, but quite simply, with the retelling of a story that changed you in even the smallest of ways. Because, as Oprah showed in her speech, there is a direct link between the two. Oprah’s full speech text here. Learn more about Retellable here.